HEART does not have a shelter facility – all HEART animals waiting for adoption are in foster homes. HEART relies on volunteer foster homes – one of our most critical needs. The number of animals we can help is closely linked to how many foster homes are available. Foster homes provide a warm, safe, healthy, loving, environment for the foster animal. A foster parent provides good quality food, fresh water, clean litter, socialization, and lots of love. Foster pet parents prepare the animal for life in a “real” home. Some of our rescued animals have never had that experience. You will know how rewarding it is when you watch a new owner shower your foster pet with kisses and love, and know that you had a hand in saving the life of an animal. WHAT KIND OF ANIMALS NEED FOSTER HOMES? We need help with adult cats, mothers with litters, pregnant cats, kittens, cats recovering from surgery, timid cats, special needs cats and sometimes dogs or puppies. Foster parents must be 21 years of age or older. Foster homes are families, couples, or people living alone. Most of them already have pets of their own. People who work 9-5 can often be wonderful foster parents. Renters will be considered with landlord approval. Fostering does require some patience, and the effort to make it work. We are so often amazed at the creative and kind ways foster homes are able to fit in that extra cat that needs their help. IF I HAVE PETS CAN I STILL BE A FOSTER PARENT? Absolutely, as long as your pets are comfortable with their new visitors. All pets owned by the foster parent must be in good health, up to date on their vaccinations, altered, not aggressive, and licensed. Just as when adopting a new pet, we recommend that the foster cat at first be kept separate from your pet to give him or her time to adjust to the foster folks. Some pets adjust quite quickly to a “visitor”. And in some cases, the foster pet is kept separate, and is given their own time and attention. If your cat throws himself at the door of the room where the new cat is or if your dog is just beside himself we will send the foster animal to another foster family as soon as we can. HOW LONG WILL A FOSTER ANIMAL BE IN MY HOME? It is very hard to determine the length of time a foster parent will be caring for an animal – it could be a few weeks to several months. We try to leave the cat in the same foster home until it is adopted. We do everything in our power to move the adoption process along. We encourage you to bring your foster to as many adoption days as possible. ARE THERE ANY EXPENSES FOR A FOSTER PARENT? HEART pays for all veterinary and medical costs for the fostered animal. 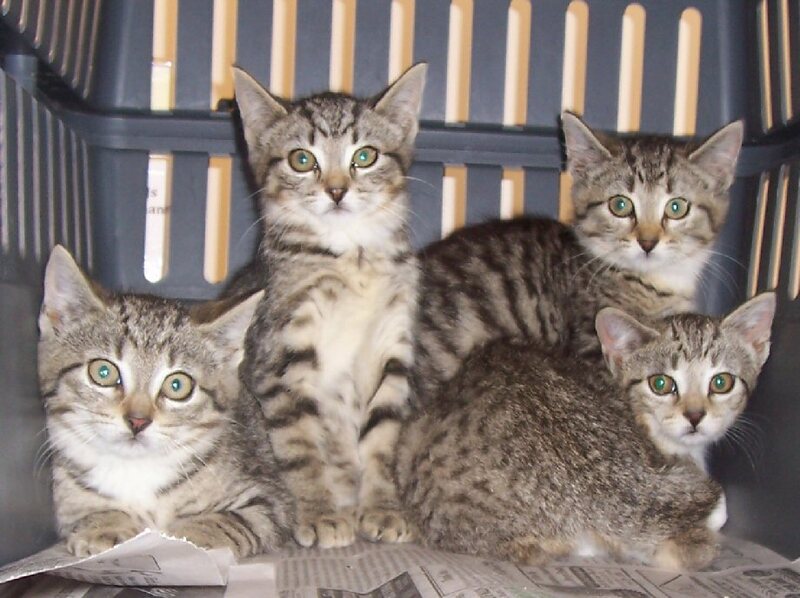 The foster caregiver is financially responsible for basic supplies such as food and cat litter. When food and litter are donated to HEART they are available at no cost to foster homes. The foster parent will be asked to transport the fostered animal to local adoption events and the vet at their own expense. Every animal brought into HEART is examined by a veterinarian before it is placed into foster care. We make sure the animal is tested for communicable diseases, to ensure the “foster brother and sister” cats and dogs are not at risk. All animals receive complete vaccinations, including rabies, and are treated for fleas and worms. If the cat hasn’t been spayed or neutered that will be arranged. HEART will do all it can to determine the health of the animal before it goes into your home. If there are known risks, you will be advised at the time of foster placement and it is your choice whether to take on the responsibility. WON’T IT BE TOO HARD TO GIVE UP MY FOSTER PET? We all get attached to our foster animals. And fostering does involve some sacrifice. But that is also part of what makes fostering so special. There is sadness and some tears when your foster pet leaves but there is also an immense feeling of satisfaction that you have been a major part in saving an animal’s life. It is especially rewarding to hear the new home call back and talk about the most wonderful pet in the entire world and know that it was your love and care that helped to make that pet such a special animal. At that point your job has been done and, somewhere, a new animal needs you. DO I GET TO PICK MY FOSTER? Our goal is to place an animal with you that fits your needs and wants and is compatible with your lifestyle. We will help determine which of our pets fits that description. DO I HAVE ANY SAY IN WHO ADOPTS MY FOSTER? HEART has the final approval, but the views and opinions of foster parents are given great weight in placing the animal into a new home. HEART wants the people who know and love the animal best to be absolutely confident it is going to a good home. CAN I ADOPT MY FOSTER? If you find it hard to say goodbye foster parents can adopt their foster cat but adoption is contingent upon meeting HEART adoption guidelines and payment of adoption fees. CAN I ADOPT OUT A FOSTERED ANIMAL TO SOMEONE ELSE? No. All animals in HEART foster homes continue to be the property of HEART and HEART procedures for adoption must be followed. Any person wishing to adopt an animal that you are fostering must go through HEART and follow all normal HEART adoption procedures. Each foster parent must complete a Foster Home Application and sign a Foster Home Agreement. An inspection of the foster home will be done prior to approval to ensure that you can provide a safe place for an animal. Once your home has been approved you will be contacted and asked to foster an animal in need. 1. I agree to provide for the care and safety of this animal and to provide a healthy, loving, safe environment until the animal is adopted into a permanent home. I am aware that fostering may be a short or long-term commitment for this animal. 2. I agree that this animal remains the property of HEART until it is adopted. I understand that a foster home may not give a HEART animal to any other person or organization other than HEART. If I cannot keep this animal as a foster or this foster situation does not work out for any reason, the animal will be returned to HEART. 3. I understand that HEART reserves the right to evaluate the living conditions of the animal at any time and I agree to surrender the animal if conditions are not found to be satisfactory. 4. I agree to provide good quality food, fresh water, clean litter, and socialization. When food and litter are donated to HEART they are available at no cost to foster homes. 5. I agree that this animal must be kept as an indoor pet only. 6. HEART shall be responsible for all approved medical bills. 7. I agree to supervise veterinary care that may be required for this animal’s health, care and well being throughout its foster care. If the animal is in need of medical attention, I agree to contact a HEART representative immediately and follow their instructions on where to take the animal. If a foster home takes an animal in without contacting HEART, HEART may refuse to be responsible for medical expenses. I will call HEART before seeking emergency medical attention, unless it is a matter of life and death where time is of the critical essence. 8. I agree to follow the instructions given to care for the animal’s special needs, such as medication, special diet, etc. 9. I agree that it is my responsibility to help socialize this animal’s behavior towards men, women, children, dogs and cats. In the event that problem behavior is noted, I will notify HEART so that HEART can determine an appropriate course of action for the animal. 10. If the animal is ready for adoption, I agree to have the animal available for showing. I agree to allow potential adopters to visit the animal at my home or at a place suitable to adopters, or allow the animal to be taken to another location to meet potential adopters. 11. When possible, I agree to help provide transportation of foster cats to HEART Adoption Center and Cat Adoption Shows. 12. I understand that HEART will make the final decision regarding permanent placement of this animal with the recommendation of the foster home. 13. If I choose to adopt this animal as my own companion, I understand that I must go through the adoption process and will owe the adoption fee. 1. I agree to keep the name that this animal was given as it is necessary for record keeping, appointments and public information. 2. I agree to provide for the care and safety of this animal and to provide a healthy, loving and safe environment. 3. I agree that this animal remains the property of HEART until it is adopted. 4. I understand that a foster home may not give a HEART animal to any other person or organization other than HEART. If I cannot keep this animal as a foster or this foster situation does not work out for any reason, the animal will be returned to HEART. 5. I understand that HEART reserves the right to evaluate the living conditions of the animal at any time and I agree to surrender the animal if conditions are not found to be satisfactory. 6. I agree to provide good quality food, fresh water and adequate exercise. When food is donated to HEART it will be available at no cost to foster homes. 7. I agree that this animal must be kept as an indoor pet only. 8. I agree to never tie up or chain the foster dog at any time. 9. I agree to never leave the foster dog in a car without air conditioning for an extended period of time, and never in the hot summer months when the air temperatures exceed 70 degrees. 10. I agree to provide a safe collar with rabies and I.D. tags to be worn at all times. 11. I agree to obey all applicable laws governing control and custody of animals. 12. I agree to foster this dog as a family companion only. 13. I agree that the dog is not to ride loose in the bed of pickup trucks, convertibles. 14. I agree to have a clean, secure fenced area for the dog. If a fenced enclosure is not available, the foster Family agrees to leash walk the dog. 15. I agree that I will never leave the dog without proper care for more than 24 hours. 16. I will never crate the dog for more than 8 hours at a time, and for never more than 16 hours during a 24 hour period. The dog will not remain solely in a crate while indoors. If I use a crate it will be large enough to allow the dog to sit, stand, turn around and lie down comfortably. 17. I agree to return any crates, bowls etc to HEART should I not be able to foster anymore. 18. I understand that HEART retains legal control of the animal and is not authorized to make any legal or medical decisions on the animal’s behalf. 19. I understand that HEART shall be responsible for all approved medical bills. If you take our dog to your vet it will not be covered and will be at your expense not HEART. 20. I agree to supervise veterinary care that may be required for this animal’s health, care and well-being through its foster care. If the animal is in need of medical attention, I agree to contact a HEART representative immediately and follow their instruction on where to take the animal. If a foster home takes an animal in without contacting HEART, HEART may refuse to be responsible for medical expenses. I will call HEART before seeking emergency medical attention. 21. I agree to follow the instructions given to care for the animal’s special needs, such as medication, special diet, etc. 22. I agree that it is my responsibility to help socialize this animal’s behavior towards men, women, children, dogs and cats. In the event that problem behavior is noted, I will notify HEART so that HEART can determine an appropriate course of action for the animal. 23. If the animal is ready for adoption, I agree to have the animal available for showing. A meet and greet is mandatory for all potential adopters and I agree to allow potential adopters to visit the animal in my home or allow the animal to be taken to the potential adopters for a meet and greet. 24. I understand that HEART will make the final decision regarding permanent placement of this animal with the recommendation of the foster home. 25. If I choose to adopt this animal as my own companion, I understand that I must go through the adoption process and will owe the adoption fee. 26. I agree that if I fail to make this foster dog available to potential adopters then this dog will be considered my personal pet and the adoption fee will be requested. 27. I agree to never give, sell or transfer the ownership of the dog to another person, relative, rescue group, humane association, shelter or pound, pet store or any medical or experimental laboratory or similar organization. 28. If I transfer the dog without the knowledge and approval of HEART, I understand that HEART will reclaim the dog from the transferee and will pursue legal means to do so if necessary, and will pursue legal means to redress any harm done to the dog. 29. As a Foster Family, I/We agree to release the previous owner as well as HEART and its representatives of any liability arising from our duties as a Foster Family from this date forward. 30. I agree to notify HEART with change of address information so that all records can be updated. 31. I certify that I have never been convicted of animal cruelty, neglect, or abandonment by a court of law or other governmental authority. 32. I certify that I have read this foster agreement in full and I understand all of the terms and conditions. I understand that if I made any misrepresentation about myself or home environment, or if I don’t abide by all of the terms and conditions of this agreement and my failure to do so in any way jeopardizes or adversely affects the health and welfare of the dog, that HEART can terminate this contract for foster care and reclaim the dog without notice, irrespective of any expenditures that I have made and may pursue legal means to do so if necessary. I understand that HEART may pursue legal means to redress any harm done to the dog. I understand that this contract for foster care is legal and binding, and will be governed by the laws of the State of New York. The Foster Parent agrees that he/she is legally competent to enter into this agreement. 33. By signing this agreement I accept all of the above mentioned..